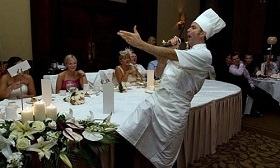 The Singing Waiters are professionally trained singers/actors who will disguise themselves as any character at your event, masquerading as waiters and waitresses, chefs, porters, banquet managers, policemen, paramedics, firemen, security staff even hidden guests! Having spent the evening performing their duties and interacting with your guests, they suddenly burst into song to the utter amazement and delight of all present. To book Masquerade The Singing Waiters or to talk to us about your corporate event requirements, please submit the enquiry form or call us on 087 718 1360.